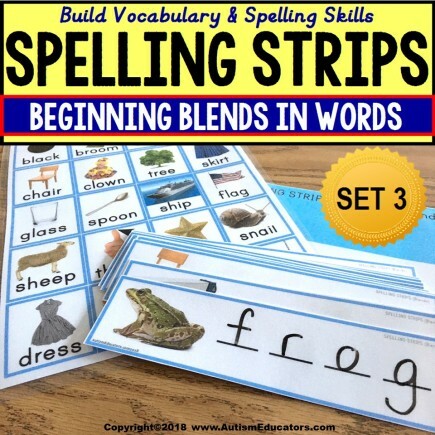 HOW CAN I USE THE SPELLING STRIPS WITH MY STUDENTS? 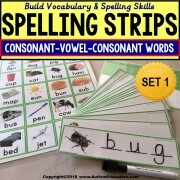 Do you have students who find it difficult to sound out or spell words? 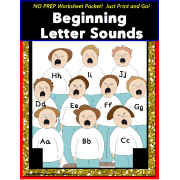 Does it seem to frustrate them during writing activities? 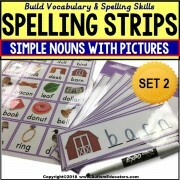 If YES, then this set will help your students learn new vocabulary with easy memorization using real life pictures. Have them first review the STUDENT VOCABULARY PICTURE GUIDE. Then, give them the strips to write the words from memory! I HAVE STUDENTS WHO ARE NOT YET ABLE TO MEMORIZE OR SOUND OUT WORDS. HOW CAN I USE THIS ACTIVITY WITH THEM? 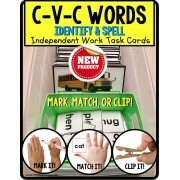 For these children, allow them to use the STUDENT VOCABULARY PICTURE GUIDE as an easy reference. 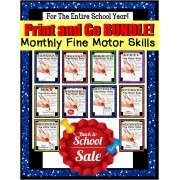 This will reinforce an important skill, as they now look back and refer to a guide for help. 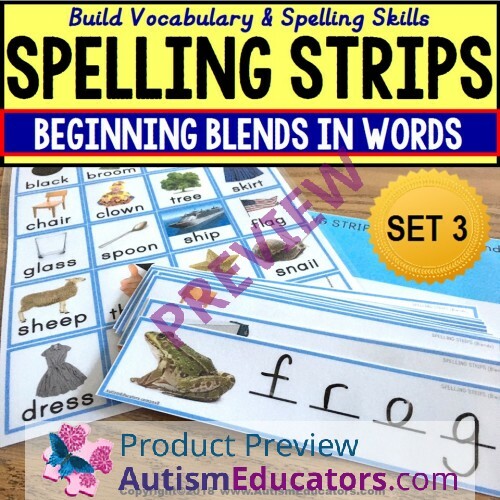 This set includes beginning blends for beginning or early readers. Using pictures/words that are familiar to most children, this activity promotes successful learning! ARE THERE MORE SETS AVAILABLE? 1. 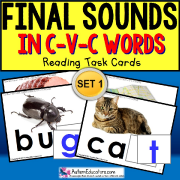 Given a picture/word card depicting a _____________(consonant-vowel-consonant word/word that begins with a blend/simple noun), STUDENT will read and say each word aloud, by using the VOCABULARY PICTURE GUIDE as visual support, with 80% accuracy, in 4 out of 5 opportunities, by MONTH, YEAR. 2. 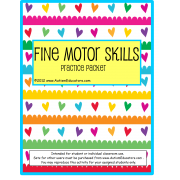 Given a picture and blank lines to write and spell the word, STUDENT will ______________(refer to/rely upon memory/use phonics skills to sound out and spell), up to twenty words, with 80% accuracy, in 4 out of 5 opportunities, by MONTH, YEAR. THANK YOU SO MUCH FOR YOUR CONTINUED SUPPORT AND DEDICATION TO OUR CHILDREN WITH SPECIAL LEARNING NEEDS. © Copyright 2018 Autism Educators, Inc. (AutismEducators.com). All rights reserved by author. This product is to be used by the original purchaser only. Copying for more than one teacher or classroom, or for an entire department, school, or school system is prohibited. 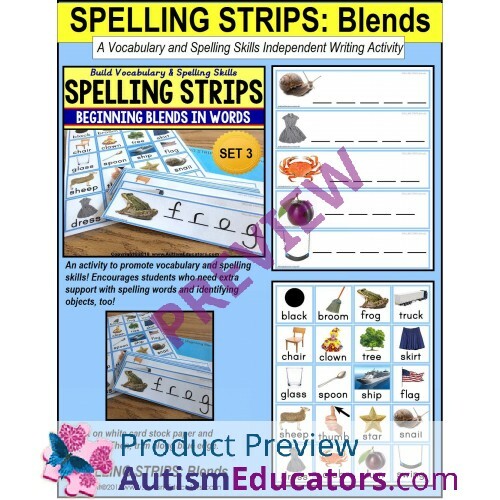 This product may not be distributed or displayed digitally for public view, uploaded to school or district websites, distributed via email, or submitted to file sharing sites such as Amazon Inspire or ANY sharing websites which include Facebook Sharing files. Failure to comply is a copyright infringement and a violation of the Digital Millennium Copyright Act (DMCA). Intended for single classroom and personal use only.